Oh I’m madly in love with this new Seb Lester print, classic adage. It’s really really pricey though. The sentiment is perfect and I love the coolness factor, the Mirri paper changes colour depending on the angle you are viewing it from, and the lighting conditions. Click here to watch Seb’s video showing the colours changing. I want I want! Anyone looking to buy me the gift of my dreams- this is it!!! No?….oh well. 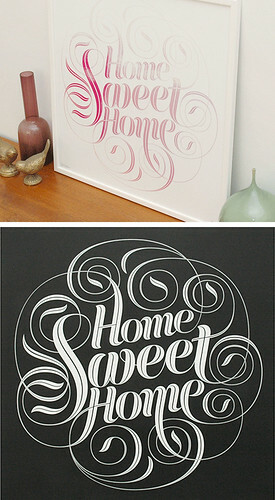 Here’s where I’ve posted about Seb Lester’s amazing typography before. This is lovely and I think you deserve it as you’ve been such a caring wife (hint hint) — hope poor Dave is feeling better! I love these prints too. I would prefer one that’s framed. I hope you get the print you deserve! The pinkish one in the white frame is total perfection…it’s true. It’s not my birthday though and I have no room on my walls but maybe in a few months I’ll find a spot for it. It’s so great! aw, it looks like a giant doily 🙂 it’s very pretty! now that you point that out Iva, I totally see it. That’s great! A beautiful use of Mirri. And an amazing design.